BRANNON STEEL has been recognized and awarded the bronze level for Caterpillar’s Supplier Quality Excellence Process. Through demonstrated results, BRANNON STEEL has exhibited excellent process control, and shown the desire for ongoing continuous improvement and has provided Caterpillar and their customers quality burn to shape products. 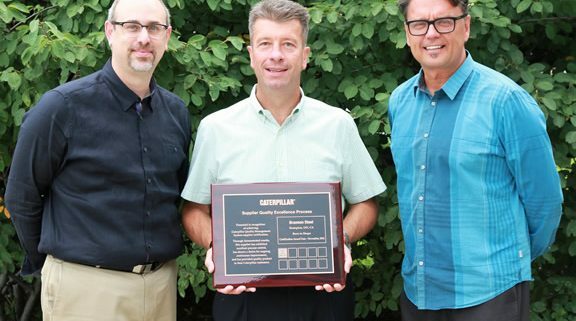 “Our team is very proud of this acknowledgement for everyone’s hard work and dedication to meet Caterpillar’s world class quality requirements. “Burn to Shape” is one of our core competencies and our focus and dedication to this process will continue to provide the very best of customer service and quality for Caterpillar and their customers.” said Kirk Brannon (President of BRANNON STEEL). BRANNON STEEL launches a new state-of-the-art Pinnacle Industrial Automation Plasma-Bevel machine featuring the Hypertherm HPR400XD with 45° Contour Bevel Head. The addition of the new machine simultaneously expands BRANNON STEEL‘s plasma cutting capacity, improves operational efficiency by reducing the need for secondary manual bevelling processes and realizes the company’s ongoing pursuit of new methods and technologies. 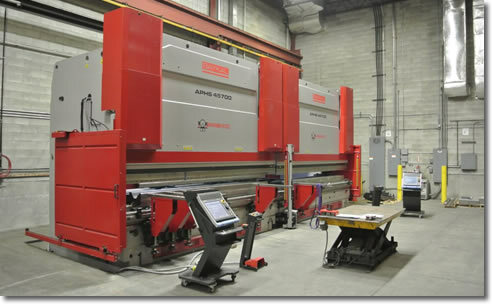 Combined with a team of highly-skilled employees, an ever-expanding menu of production equipment means BRANNON STEEL will continue to provide its partners with industry-leading quality and delivery as it has been doing for 45 years and places the Brampton, Ontario manufacturer in a solid position to take on new business. BRANNON STEEL is registered to the ISO 9001:2008 quality standard and the ISO 14000:2004 environment standard. BRANNON STEEL has increased machining capacity and capability with the addition of the new Mazak Nexus 530C Vertical Machining Centre. 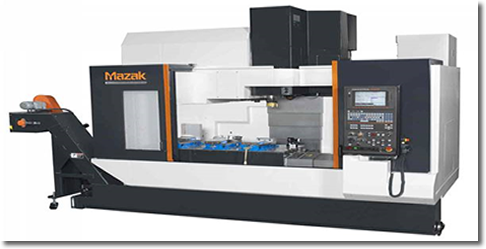 The 530C combines advanced technology and productivity for a wide variety of applications and seamlessly integrates with our existing Mazak equipment. BRANNON STEEL remains committed to upgrading and expanding production equipment capacity in order to provide an uninterrupted supply of superior quality parts for our customers. BRANNON STEEL is registered to the ISO 9001:2008 quality standard and the ISO 14000:2004 environmental standard. BRANNON STEEL finalizes agreements to secure nearly $2 million in process machinery, associated equipment and training for its Brampton, Ontario manufacturing facility. First to arrive will be an NTC TLX-series 7000 watt laser cutting system capable of processing mild steel up to 50’ x 14’ x 1.25”. This combination of accuracy, consistency, power and a large cutting area makes the TLX an ideal addition to the company’s already extensive menu of available cutting formats. Installation is currently underway and the machine is expected to begin full-scale production in early summer 2015. Later this year, BRANNON STEEL will introduce two Baykal 750 ton APHS hydraulic press brakes that, in addition to being operated independently, can be operated in tandem to provide 1500 tons of capacity and accommodate work pieces up to 29.5’ wide. The purchase not only expands upon current capabilities but also represents definitive action to ensure operational continuity as existing equipment approaches the end of its useful life. BRANNON STEEL is one of North America’s leading providers of carbon steel parts and services. Since its founding in 1968, the company has maintained a place at the forefront of the industry by investing in new equipment, technology and a highly-skilled workforce. BRANNON STEEL has secured an additional 70,000 sq. ft. of manufacturing space as part of the continuous expansion of the value-added services offered to its customers. Located less than 500 meters from BRANNON STEEL’s Brampton headquarters, the new facility is equipped with 10 overhead cranes and will be home to the company’s Saw Cutting and Structural Rolling operations along with customer-dedicated Kitting and KanBan activities. The move also allows BRANNON STEEL to optimize space at its current 120,000 sq. ft. facility by making room for NEW processing equipment coming in the spring of 2013. These state-of-the-art additions reinforce the company’s position at the forefront of the industry and ensure its customers continue to receive high-quality, cost-efficient parts. BRANNON STEEL is nearing completion of the installation of three Hypertherm HPR400XD high definition plasma cutting machines featuring True Hole™ technology. This is the second phase of an aggressive project BRANNON STEEL undertook in early 2010 to dramatically improve the accuracy, flexibility, quality and speed of its plasma cutting systems. With significant investment and extensive research & development, BRANNON STEEL continues to be one of North America’s leading providers of carbon steel services. 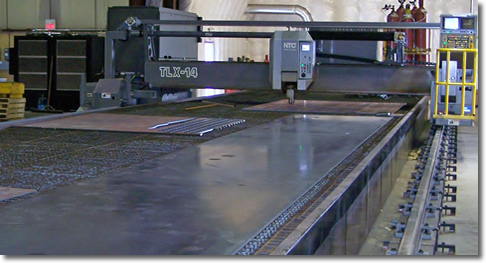 Click here for a full list of BRANNON STEEL’s plasma cutting and scribing capabilities. Visit Hypertherm for more information about True Hole™ technology.